TECHNOLOGY 5 0 | B R O A D B A N D C O M M U N I T I E S | w w w. b r o a d b a n d c o m m u n i t i e s . c o m | J A N U A R Y / F E B R U A R Y 2 0 1 9 Value Engineering Adds Efficiencies For Huntsville Utilities As electric utilities consider fiber network plays, well-thought-out designs will be key to their success. Here's how Huntsville Utilities used value engineering to control fiber network construction costs and hone its plan. 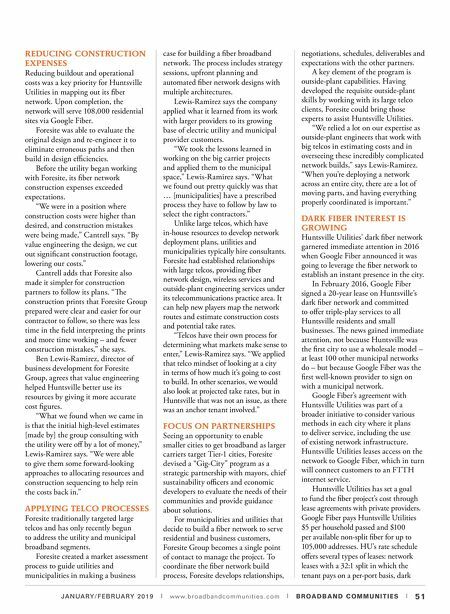 By Sean Buckley / Broadband Communities A s Huntsville Utilities advanced its wholesale dark fiber network – one that attracted Google Fiber as an anchor tenant – the utility found that it could achieve its buildout goals on budget with value engineering help from Foresite Group. Value engineering is a method of increasing the value of products or services through an examination of their functions. Value, which can be manipulated by either improving function or reducing cost, is defined as the ratio of function to cost. Stacy Cantrell, vice president of engineering for Huntsville Utilities, says Foresite Group helped the utility rein in costs and tighten the network design. "Before Foresite was brought in to take over project engineering, we were in a rough spot – there was no value engineering to the project, so there was a lot of less- efficient design and unnecessary construction cost," Cantrell says. "We also had low-quality construction prints that caused additional inefficiency during construction." 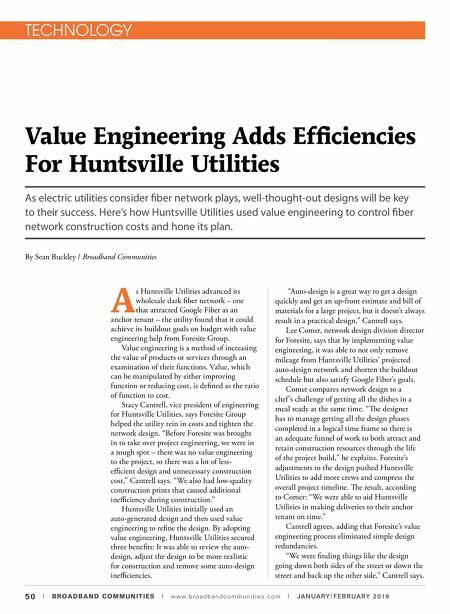 Huntsville Utilities initially used an auto-generated design and then used value engineering to refine the design. By adopting value engineering, Huntsville Utilities secured three benefits: It was able to review the auto- design, adjust the design to be more realistic for construction and remove some auto-design inefficiencies. "Auto-design is a great way to get a design quickly and get an up-front estimate and bill of materials for a large project, but it doesn't always result in a practical design," Cantrell says. Lee Comer, network design division director for Foresite, says that by implementing value engineering, it was able to not only remove mileage from Huntsville Utilities' projected auto-design network and shorten the buildout schedule but also satisfy Google Fiber's goals. Comer compares network design to a chef 's challenge of getting all the dishes in a meal ready at the same time. "e designer has to manage getting all the design phases completed in a logical time frame so there is an adequate funnel of work to both attract and retain construction resources through the life of the project build," he explains. Foresite's adjustments to the design pushed Huntsville Utilities to add more crews and compress the overall project timeline. e result, according to Comer: "We were able to aid Huntsville Utilities in making deliveries to their anchor tenant on time." Cantrell agrees, adding that Foresite's value engineering process eliminated simple design redundancies. "We were finding things like the design going down both sides of the street or down the street and back up the other side," Cantrell says.